AS MALAYSIA continues up the path towards becoming a tech-driven nation, more industries are expected to implement Internet of Things’ (IoT) systems as part of the global trend towards Industry 4.0. 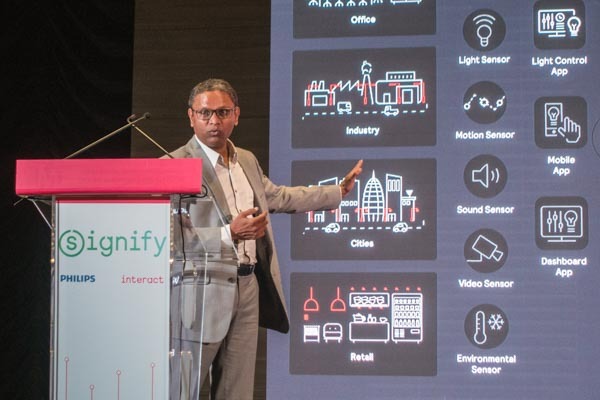 Looking to take advantage of this appetite for connected technologies is Signify, previously known as Philips Lighting, as it launched its Interact IoT platform in Kuala Lumpur on Nov 14. The company’s chief executive officer in Asean Alok Ghose explained how the recent launch of the Industry4RD National blueprint by Prime Minister Dr Mahathir Mohamad highlights Malaysia’s commitment towards the digital transformation of its manufacturing sector and related services. “Signify is ready to assist Malaysian customers in embracing the future of higher production efficiency, stronger digital talent pools and greater cost savings through the Interact IoT platform,” said Alok. The platform, which has been in development for half a decade, is said to act as a backbone for IoT devices and is largely targeted towards commercial and professional users. Alok said that the company sees immense scaling up possibilities in all sorts of different verticals and applications that range from hospitality, smart cities, architectural lighting, sports stadiums, retail, offices and even warehouses. He cited some examples of how the company’s smart lighting products would benefit these various sectors. Logistics centres, for example, can utilise Interact Industry to gather data via indoor positioning technology embedded in the LED lighting to track activities in real time as well as help workers optimise their processes and workflow. Interact Retail meanwhile, has solutions that can provide real-time, historical and predictive analytics to help store managers restock fast-selling items or provide indoor navigation for staff and customers. “Interact’s high scalability and cloud-based platform uses sophisticated and modern data management and data-processing capabilities to create data-enabled services for customers,” said Alok. In addition to its wide application of services, Signify says that Interact allows its customers to easily manage and remotely control user and device security, authentication and authorisation for its connected lighting system. With the new official presence of Interact in Malaysia, the brand is set to encourage local customers to take their first steps towards IoT-connected lighting. There are already some projects that have been implemented across Malaysia. One is in the state of Malacca where 1,500 LED street lights are connected by Interact City lighting asset management software. The project is said to have saved the heritage city up to 80% in energy costs while allowing the local authorities to control and monitor the new street lights remotely. Apart from this, other projects that are primed for integration with the Interact platform include the Setia Spice landmarks in Penang and the Menora Tunnel in Ipoh, Perak. He cited other examples of projects that use the Interact platform including one in Jakarta where 150,000 street lights in the Indonesian capital were upgraded and connected using Interact City lighting asset management software. Signify has also launched Interact in Singapore and Indonesia.